The beginning of the year brings about a sense of renewal and excitement, but it is also the coldest time of the year. While most of us bundle up in the warmest winter coats we can find, some our fellow neighbors are not as fortunate to have a cozy coat to wrap around their body during these icy months. We at KIWI Services want to help bring warmness to the people who need it most. We will be running a coat and blanket drive from January 15th until January 31st, and we would love it if our KIWI Lovers helped contribute to this cause. 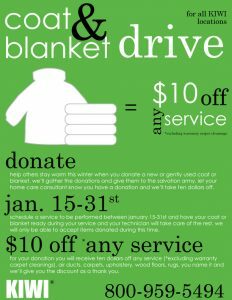 When you donate a coat or blanket, KIWI will take an additional $10 off any service we perform. All donations will go to the Salvation Army. KIWI is a company that has been serving our communities for 30 years. We have a long-standing tradition of helping out in our communities with charity drives of all sorts, ranging from blood drives to food and clothing drives. We feel that it is important to give back and extend a lending hand. We at KIWI also offer the best home cleaning services in the country. Our services include: air duct cleaning, carpet cleaning, carpet repair, tile and grout cleaning, rug cleaning, rug repair, wood floor cleaning, upholstery cleaning, and water damage restoration. We have a great team of sales representatives, customer service representatives, and technicians who are happy to assist you with any questions you may have regarding the coat and blanket drive or anything else. KIWI is also home to the one-year carpet cleaning warranty, which allows you to get your carpet cleaned for just $7 a room plus a small trip charge when you receive carpet cleaning or repair services valued at $120 or more. We also offer a 30-day clean guarantee on all of our cleaning services and a one-year guarantee for our repair and water damage restoration services.